Meigle 1 Stone: A Pictish Camel? 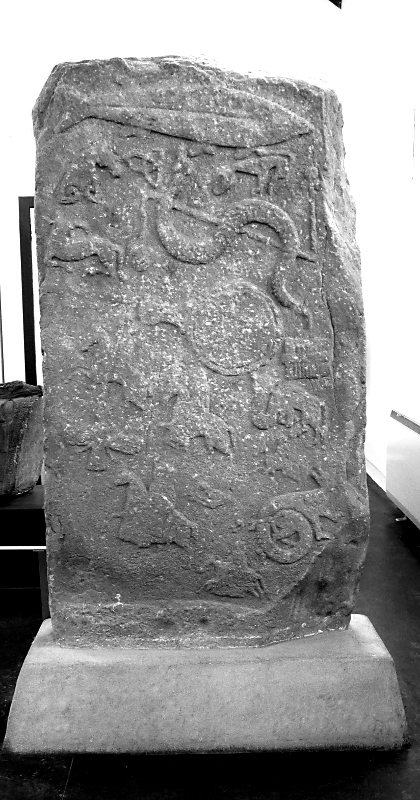 This stone (class II), now in Meigle Museum, Angus, was originally located to the north of Meigle Kirk and may date from the late eighth or early ninth centuries. The stone was almost certainly originally a neolithic standing stone, and has ‘ring and cup’ marks from that period in time. On one side is a cross slab, with an ornate cross and accompanying beasts. The other side has a jumble of figures and classic Pictish symbols. The symbols include a large fish and a serpent with z-rod, there are also two smaller symbols – a horse head and a Pictish beast. Below these classic symbols are the subsidiary Mirror and Comb symbols that so often accompany symbol pairs. Below this are horsemen and hounds and at the bottom right a fabulous beast. In amongst these figures are an Angel-like figure, which has been suggested may be a Persian deity and below the comb – bizarrely a kneeling camel! The presence of a camel on a stone from the East of Scotland would certainly seem to be a puzzle. However, remembering that this is a Christian stone, monasteries, of which there were a number in Pictland, possessed libraries which could have contained books originally from other parts of Europe and beyond. It is certainly conceivable that the sculptor had access to an exotic ‘bestiary’, and certainly more likely than camels roaming the Angus countryside! Whatever the explanation, it is a reminder that the Picts were not an isolated people, but had connections to Europe and beyond. Posted on November 24, 2011, in Pictish History. Bookmark the permalink. 1 Comment. Why would a camel have a short Tyrannosaurus-type arm sticking out in front of it? I don’t think it’s a camel.